Vacation rental house. 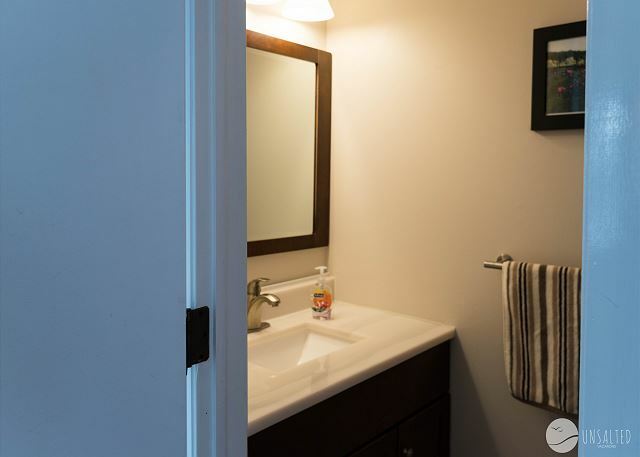 Sleeps 10, 3 bedrooms, 1.5 bathrooms. No pets allowed. Lake Michigan in the distance. Imagine the sunsets! The spacious kitchen comes fully equipped with everything you would need for your summer feast. The large bar is great for meal prep and buffet style dinners. 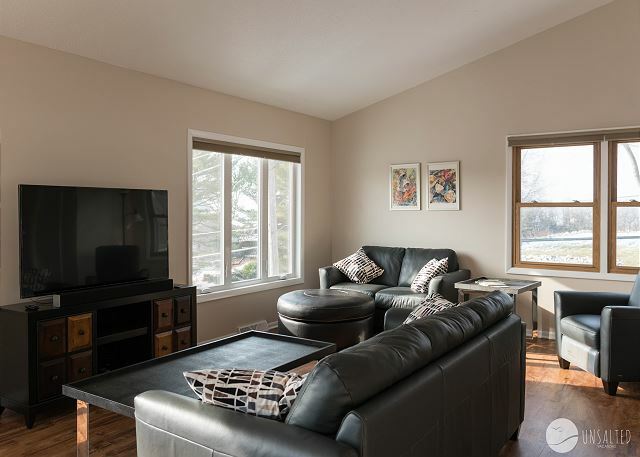 The bright and airy living room features new furniture and a flat screen TV. Bedroom #3 is off the kitchen and has a queen bed. 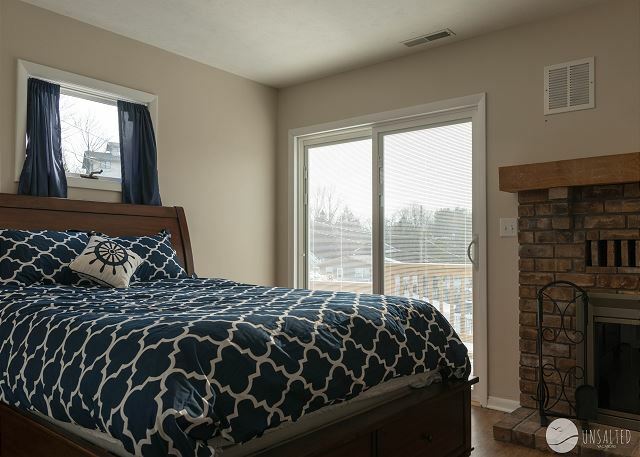 Bedroom #1 with a queen bed and a slider that leads out to the patio. 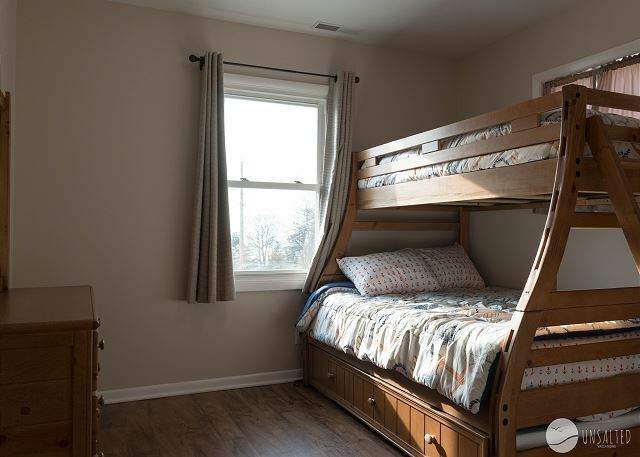 Bedroom #2 with a twin over full bunk and a twin trundle. 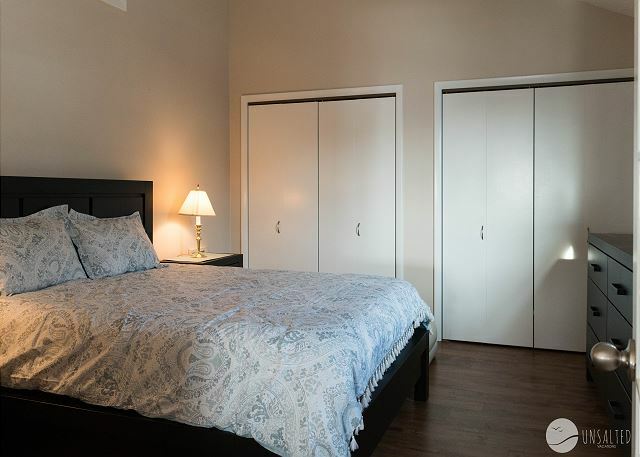 Bedrooms 1 and 2 are side by side and the bathroom entry is on the left. Twin over twin bunks are located in the breezeway. 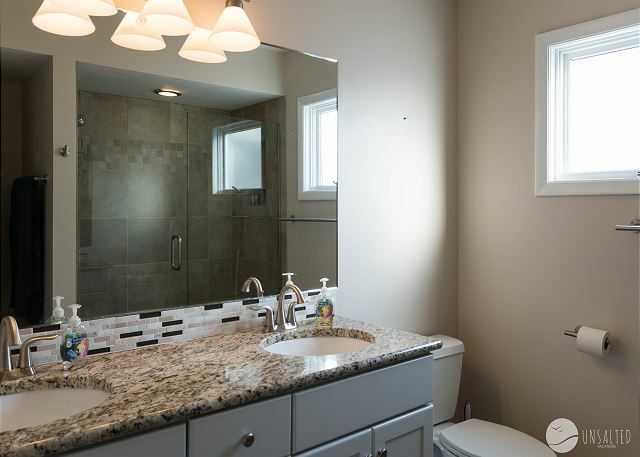 Full bathroom on the first floor with double vanity and a large, tile shower. The half bathroom is located off of the kitchen/living room. Patio with comfy furniture and large umbrella. Perched at the top of 5 mile hill. Lake Michigan is right down the road -- Get ready for beach days! My Blue Haven provides a great retreat for those looking to spend their vacation days at the beach. 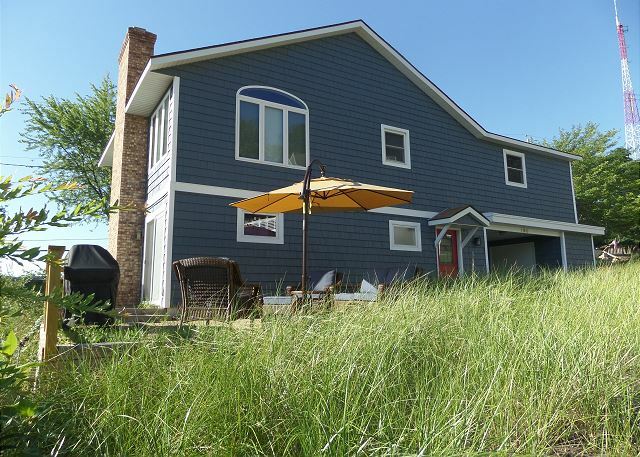 This 3 bedroom, 1.5 bath cottage style home is right up from the state park beach and other Grand Haven highlights. Coming in at 2,000 sq feet, it is perfect for a larger group and it features new furnishings and amenities for a hassle-free vacation. This vacation home is spacious and welcoming, just as a beach house should be. 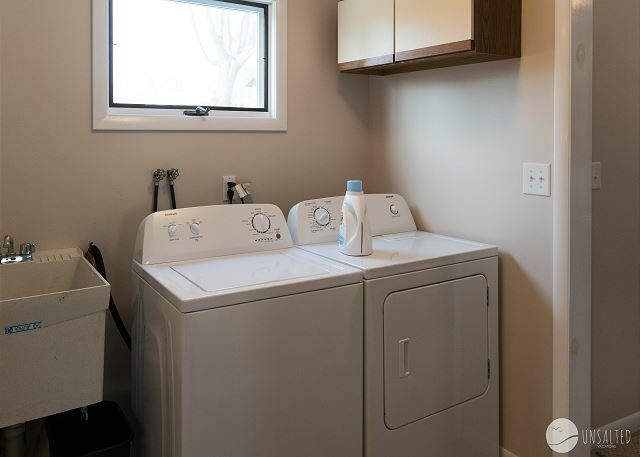 The first floor features two bedrooms, a full bathroom with double vanity and tile shower, breezeway and a separate space with a washer and dryer. Upstairs you will find a spacious kitchen with large bar, living room with a large flat screen TV, and an additional bedroom. Take the conversation outside and unwind on the patio fit with comfy furniture and a gas grill. Enjoy the summer sun or cool down in the shade of the large umbrella. Parking: There are 3 parking spaces provided. One in the carport, one in the driveway, and one more in the gravel driveway to the right of the home. The cottage sleeps 10. All bed and bath linens are provided. The eat-in kitchen comes fully stocked with pots and pans, dinnerware, drinkware, and all standard appliances. 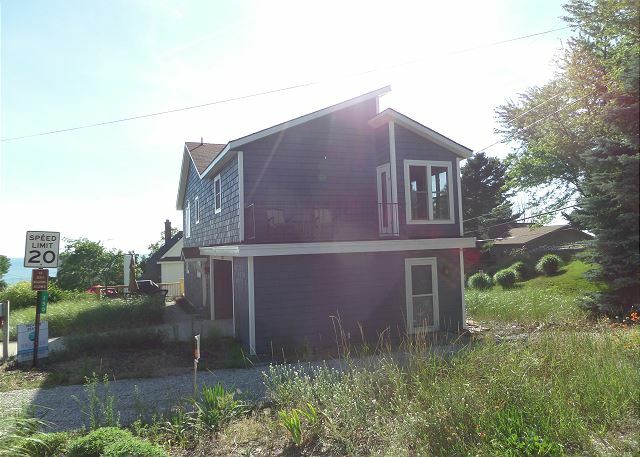 My Blue Haven is perched at the top of 5 mile hill, a quiet neighborhood across from the Grand Haven State Park. 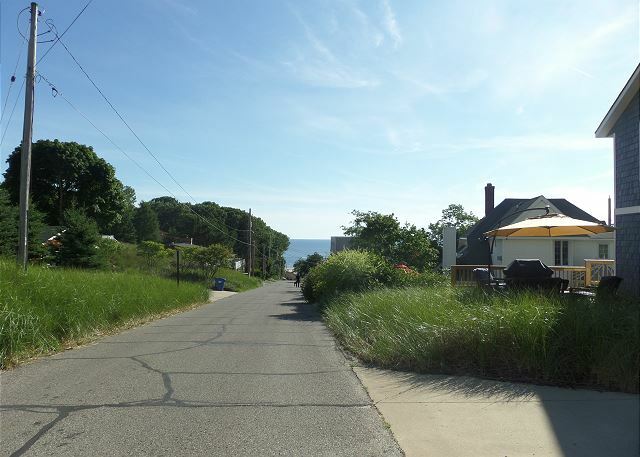 Walk down to the beach area and spend the day catching rays and enjoying the beauty of Lake Michigan. Additionally, be sure to take a walk or bike ride down the boardwalk to downtown Grand Haven for shopping and dining. The Imagination Station playground, the Dairy Treat ice-cream shop, splash pad, and Chinook Pier for mini-golf are all within a mile as well. If you're looking for a classic Lake Michigan vacation, you're in the right place! We rented this during my Daughters Wedding in Grand Haven and the place was amazing, well maintained excellent location and large. The only issue we had the Internet connected fire alarm went off in the upstairs bedroom the middle of the night and scared us half to death! It was very very very loud. Overall an excellent experience. Great family house rental, would definitely recommend. Hi Frank - thank you for leaving this review. We are happy to hear that you enjoyed your vacation, please come back and see us again soon. We loved staying at My Blue Haven! We enjoyed the short walk to the beach and the close location to downtown. The living room/kitchen/dining room are all one space, which was perfect for our large group to hang out all together in. Thanks for a fun weekend! Hi Ellen - we were thrilled to hear that you enjoyed yours stay at My Blue Haven in Grand Haven. It is a great spot, glad you were able to stay. Please keep us in mind in the future! Great location! We enjoyed this property. It truly was a hassle free vacation and I highly recommend the management company. Only downside was one shower so not the best for a big group. But the house is spacious and the patio is great for relaxing during the day. Thanks for a 5 star review! We're so glad to hear you enjoyed vacation and hope you'll visit with us again!